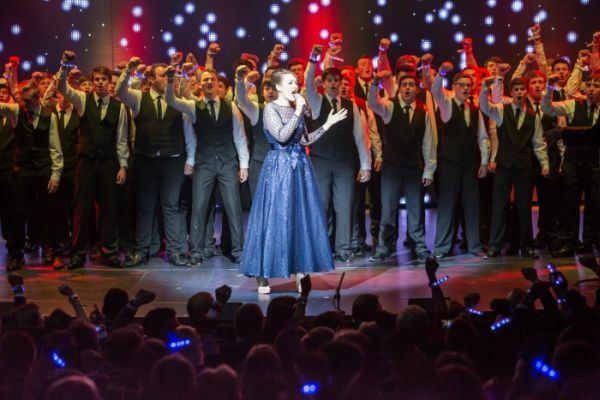 Just a couple of weeks back Royal Caribbean International, the world’s largest cruise line, introduced Anthem of the Seas with an extravagant naming ceremony at Southampton, Britain’s largest cruise port. One month previously it had been P&O showcasing a new vessel, Britannia, perhaps a slightly less hectic occasion, with The Queen as guest of honour. With P&O it was 24 hours for trade and media, whilst RCCL took the ship to sea for two nights into the English Channel on the Monday (20 April). At some point our iPads changed to French time and it is likely we passed by Guernsey and Jersey although with the very generous open bars and eating places (there are 18 of them) for most it did not matter. Some even stayed on in Southampton for a further night after disembarking Anthem. Explorer of the Seas arrived on the Thursday prior to an inaugural cruise after a $100m refurbishment. Both ships have a busy summer programme out of the port until October. BTN will report on Explorer next month. One thing was made clear by both Stuart Leven, Managing Director of Royal Caribbean International, and previously David Dingle, Chairman of Carnival UK Britannia’s owner, the two ships do not compete, Anthem slightly larger (167,800 tons and 4,180 lower bed passengers v Britannia (141,000 tons and 3,647 guests). Whilst initially set up for the UK market (80% of customers for this season) Anthem is designed for America and US tastes. There is an 18% service charge on the bars and speciality restaurants. Britannia is more reserved and the styling less flamboyant. With both ships the entertainment is outstanding “We will Rock You” on Anthem at 90 minutes probably the longest show at sea, a fantastic production, easily worthy of London’s West End, in the world’s most modern theatre. And it is free too (or at least part of the package). 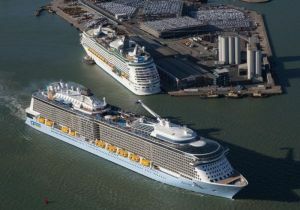 The two ships complement each other, the mass national advertising by all cruise companies helping to expand the market. Stuart Leven noted that 30m holiday packages were sold last year against 1.6m cruise trips. There is ample room for growth. He said that cruising offered tremendous value. You can’t argue with that. Where do you start with Anthem? Yes it is very big, but also extremely easy to find one’s way around. It all flows very nicely and with the Quantum Class ships (Athem is the second with Ovation to come next year) RCCL have done away with the large three-storey balcony restaurants featured on earlier ships and introduced four themed main eating places. It works very well. ‘Dynamic dining’, a new innovation, comes in two styles. ‘Choice’ gives you the freedom to pick and choose your restaurant and dining times each day and night. ‘Classic’ is a new option for those who prefer the traditional main dining style with the same dining time each night, with the same waiters and companions throughout the cruise. There is a selection of 10 dining areas every evening. RCCL have been in the cruise business since 1968, has enormous experience, and since 1995 has been developing a whole series of mighty ships currently offering 23 vessels or 106,000 sea rooms per night. Anthem is the second of the Quantum class, built by Meyer Werft, Papenburg (Germany), with Harmony of the Seas due in 2016. RCCL is very proud of its interior staterooms with a Virtual Balcony, a high-definition screen that spans nearly floor to ceiling, providing real-time views of the ocean and destinations. We are told you will not be seasick if the ship has any motion, your balcony video will go up and down but your brain is even cleverer not noticing the movement. (In any case there is a very sophisticated stabilising system fitted). Perhaps RCCL should leave one (virtual) stateroom free as another attraction. It does feel very real and should be very interesting at sea! Some interior cabins can be made up as a suite, ideal for families. 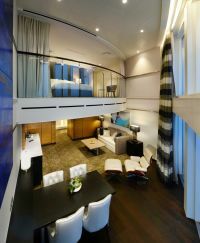 This is also available with certain standard balcony staterooms. The whole ship is very high tech, a wrist band provided for opening your stateroom door, checking the programme, paying for an item, booking a restaurant or tour, or perhaps viewing (and ordering) images taken by the ship’s photo team. Tablet stations are provided throughout the ship and also large interactive ship diagrams. It is difficult to get lost. Readers will note that it is impossible to get around Anthem in 24 hours, suffice to say that Stuart Levi has a pedometer and claimed to walk 12 miles on the first day. He is a fit Scot! The media were allowed down into the impressive engine/services control room and used 950ft long spine corridor on deck one to also visit the laundry, very much automated. The days of hand pressing table clothes are long gone. The stewardship of waste is also very carefully managed, virtually everything being recycled. 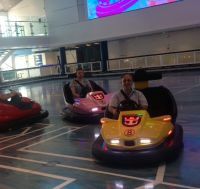 There is no ice skating rink on Anthem, as on other RCCL ships, and no ice show, replaced by SeaPlex, the largest indoor active space at sea, complete with bumper cars, a circus school, roller skating and all sorts of sports activities including basketball. There is a DJ to keep things moving. Another innovation is North Star, providing guests with breath-taking, panoramic views from 300ft above sea level. RipCord by iFLY is the first skydiving experience at sea. Flowrider is for surfers (water type). Training given. For the children the facilities are exceptional. The wrist bands do help with checking in and out for the under 13s but you can leave them in professional care from 09:00 to 22:00 including meal times (you have to pay for later assistance). The RCCL solution to eating is easy. Room service is pointed in the direction of the “Adventure Ocean” area, the children’s paradise. They choose from a quite extensive menu without the parents standing over them! You can even go off the ship and spend the day on a tour knowing that the youngsters are being properly looked after and probably having the time of their lives. You can fill a fortnight on Anthem and not spend a penny (or dollar) except for the obligatory US$12 per day gratuities charge. Ice cream is free and the Windjammer Marketplace always has a good selection of nourishment delights until 21:00 with the Sorrento Pizzeria open until 03:00. Along the impressive Royal Promenade shops, pubs and more, deep down on deck 4 The Café is always open. There is one concession to the UK market. Every stateroom has tea and coffee making facilities. Please note for the June Cruising Intelligence we will be featuring summer deep sea bargains. Cruise companies please send details in the format of company, ship, start date, length, itinerary, inclusive of (flights perhaps?) to info@btnews.co.uk by 27 May. This is neither Liverpool nor Southampton, but Long Beach California, home of the legendary Queen Mary. As part of the 175th celebrations Queen Elizabeth docked for the first time ever by her celebrated predecessor earlier this year. The camera lies a little. The earlier ship, an ocean greyhound, displaces slightly less than the 2010 model (81,000 tons v 90,000 tons), but at 1019ft is 55ft longer. 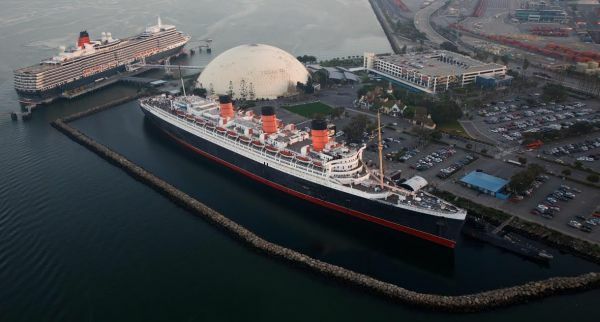 Queen Mary will celebrate the 80th anniversary of her maiden voyage in May 2016. Cunard is always ready for a party!